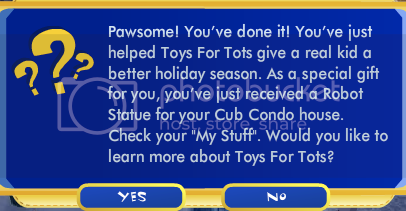 Click on the elf in Town Square to help real kids get toys this holiday season! 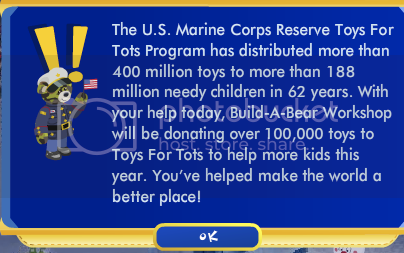 Finish the quest and BABW will donate up to 100,000 toys to children in need. Last edited by karenbearhug; 12-02-2009 at 09:24 AM.. I'm doing that quest right now!! I only have two left!! Thanks for letting us know what you get in the end, I appreciate it! 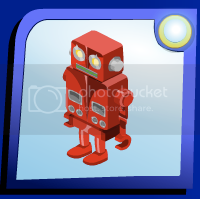 If you put the robot in your cub condo and click on it, it gives out confetti! Cool thanks! So much new stuff! Last edited by yin1; 12-02-2009 at 04:58 PM..